"It's a bit embarrassing to wear walking around in a train station!" Good golly miss molly... that must've been quite the flossy flossy swag bag! "It's the best-ever story about a girl's dream. When I started, it was just for fun. Then the whole collection sold... Apparently, Marc Jacobs thinks I'm cool, and [Comme des Garçons founder] Rei Kawakubo is wearing my clothes - it's like a dream you couldn't imagine! There's no reason to be minimal, it's so boring. Wear necklaces, rings, socks, everything! Carry a dog, a monkey, or a rat in a bag! I am crazy in my life. I'm just in my living room with fabric, watching my cat, Charlie, fight with squirrels in the garden. It's very romantic." "I think fashion's current hyper-obsession with celebrities is crass. I think it will all implode. In fact, I think it has already started to do so with Victoria Beckham modeling in the new Marc Jacobs advertising campaign. Don't you think it's ironic that this season, when Marc Jacobs referenced Comme des Garçons - the antithesis of what a footballer's wife should wear - he has chosen to advertise it on a footballer's wife?" And isn't that ironic... don't you think? It's a black fly in your Chardonnay! 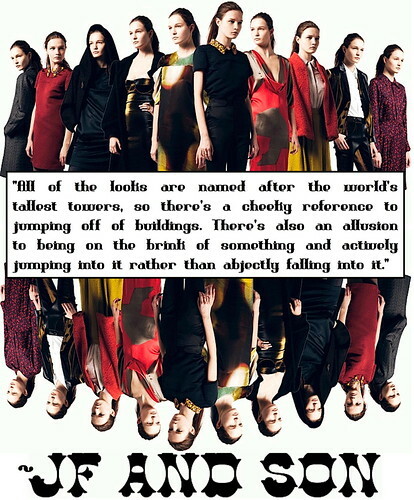 "All of the looks are named after the world’s tallest towers, so there’s a cheeky reference to jumping off of buildings. There’s also an allusion to being on the brink of something and actively jumping into it rather than abjectly falling into it." To read the entire interview with writer & historian Shiela Breckman and Jesse Finkelstein about JF & Son's about Autumn/Winter '08 collection: click clickity click click! 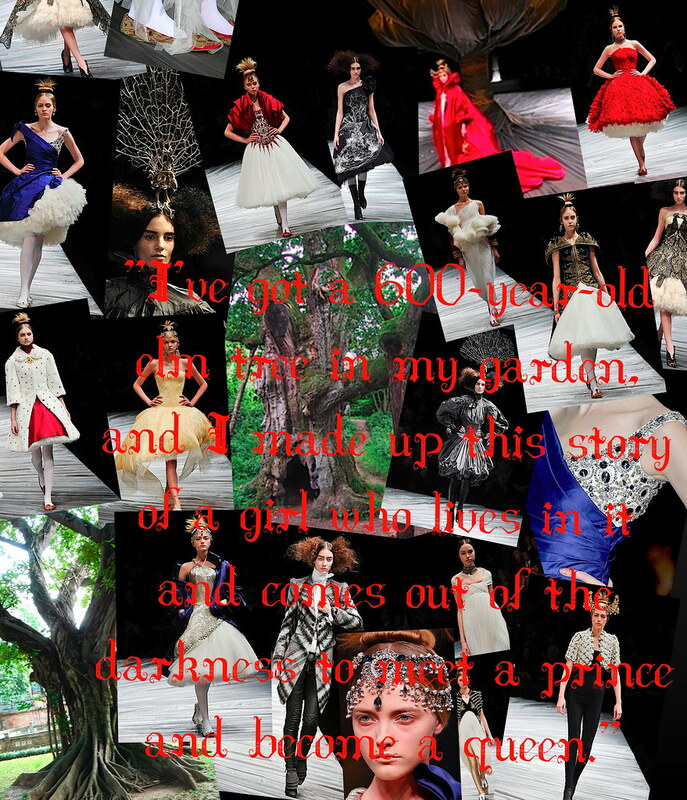 "I've got a 600-year-old elm tree in my garden, and I made up this story of a girl who lives in it and comes out of the darkness to meet a prince and become a queen." "People call me a Gothic designer, I don't think I am... I like black, I like white. I never like what's in the middle." "I'm also really interested in living a simple, natural life. Maybe being a sheep farmer and producing [my] own textiles off in the woods somewhere. So, we'll see... I might end up there in a few years." Model citizen Shalom sits down (on the floor) with Domino and generously offers indispensable earth-friendly advice. So get your bamboo notebooks handy and take note! You moved to Manhattan from Ontario. Has it been hard being eco in the Big Apple? 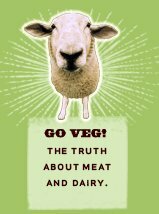 You don't have to live in the country and grow your own food to be green. I discovered there are lots of things about a big city that are really green: population density, fewer cars and more mass transit (meaning less carbon emissions). But initially, I longed for more outdoor spaces. Any of your country ways translate to city living? I've recently started composting in my apartment, which is quite an adventure. There's a Japanese system called the Bokashi (scdworld.com). You cut up your table scraps and add a special mixture that speeds the breakdown process. Compost makes houseplants very happy. Anna Cohen's edgy organic fiber separates. Crisp pieces from Noir. Linda Loudermilk jeans and baby-doll dresses. Yummy cashmere from Stuart + Brown, all made by Mongolians living in their traditional way. Paper, if I've forgotten to bring my own bag. I have a grocery tote that's made from recycled rice bags (geckotraders.com). What are some small changes we could make? Two easy things: Switch to CFLs, which use about 25 percent of the energy of an incandescent lightbulb; and if you're going to take home a doggy bag, ask for the food to be wrapped in tinfoil, which you can reuse. And, of course, buy local whenever possible. Remember, when you order online, it's not free shipping for the planet! Would you date a guy who owns a Hummer? I don't want to discriminate, but I can't imagine being attracted to someone with those values. How do you avoid seeming preachy? Nobody responds to being made to feel judged—I know I'd get defensive. It's about bringing awareness to topics someone hasn't considered. When my boyfriend and I started dating, he would buy two things at the deli and bring them home in a plastic bag. One day, I said, "Maybe you don't want to take the bag?" Just a little adapting can mean less plastic in a landfill. Citra-Solv is a natural, nontoxic Mr. Clean. It's that good! And it smells delicious. idealbite.com They have a newsletter that focuses on one thing each day—today it was recycled card companies. It's always smart, savvy and upbeat. treehugger.com Of course. vivavi.com Great source for green furniture. The Signature 1.0 bamboo console is beautiful. "Why don't you treat yourself to a new read? 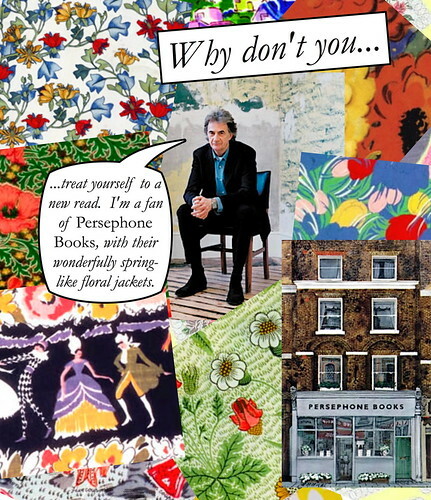 I'm a fan of Persephone Books, with their wonderfully spring-like floral jackets." "Persephone prints mainly neglected fiction and non-fiction by women, for women and about women. The titles are chosen to appeal to busy women who rarely have time to spend in ever-larger bookshops and who would like to have access to a list of books designed to be neither too literary nor too commercial. The books are guaranteed to be readable, thought-provoking and impossible to forget. 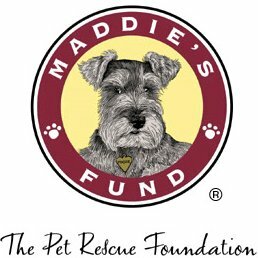 We sell mainly through mail order, through selected shops and we have our own shop. Our titles include novels, short stories, diaries and cookery books. They are all carefully designed with a clear typeface, a dove-grey jacket, a 'fabric' endpaper and bookmark, and a preface by writers such as Jilly Cooper, Adam Gopnik, and Jacqueline Wilson." "My work is very personal to me. I improvise and allow myself to loose control and see what happens if I do not think so much about practical things. The human body is always the starting point. I am really fascinating by all the ways you can highlight, distort and transform the natural silhouette of the body with clothes and accessories. I build my garments by hand from a couple of basic bricks which I multiply and attach to each other in different ways to discover the shape that I want. In that sense I approach fashion more like a tailor. The handicraft process and the handmade feeling is also very significant. I am interested in almost every traditional handicraft method. I do experiment a lot with different materials and techniques, but it is through my heavy wool collage knitting that I have found the ultimate way to express myself. It is a freedom to be able to make your own fabric while working. For me it is the absolute challenge. All the levels of skills you have to pass before you can even think about starting to improvise. It is the real thing and everything the modern fashion industry is not." "I was really nerdy. 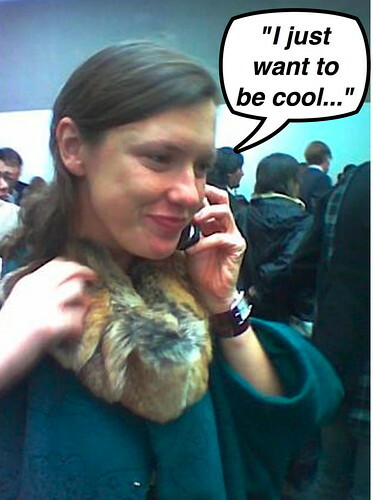 And then, kind of overnight, I can clearly remember thinking, 'I just want to be cool.' Around that time, my dad's girlfriend moved up from London and I thought she was terribly chic. She always used to wear Warehouse, which had just opened and was really good, because Jeff Banks was still in charge. So there are photos of me aged twelve wearing waist-high tight red jeans with a puffed-sleeved blue sweater and awful hair, and then aged thirteen in an ankle-length black gathered skirt, white shirt tucked in, braces (suspenders), a black tie, black lace tights, navy blue stilettos and a black beret with a veil. So it was quite quick! And I really got into going to London and going to the Great Gear Market and all that kind of thing."